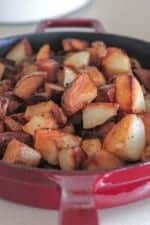 Try these Crispy Pan Roasted Potatoes for breakfast, lunch or dinner! We literally enjoy them at least once or twice a week. Where do I even start with these crispy little perfect potatoes? Not even kidding, I make these for breakfast and make extra so we can enjoy them for dinner during the week. I like to serve them with a rotisserie chicken, side of vegetables and a salad. Such a simple dinner that the family LOVES. Be sure to try these with a side of scrambled eggs in the mornings or inside a frittata like my newest Cheddar Potato Bacon Frittata coming first thing Wednesday! 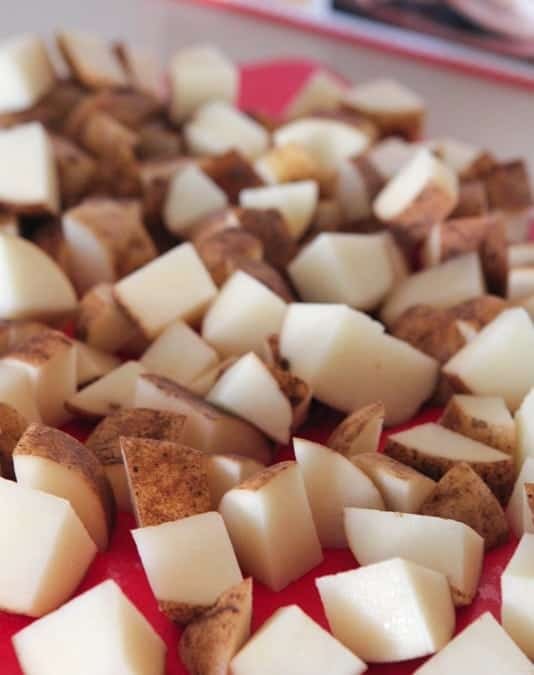 You’ll need about 3 pounds of diced russet potatoes to get started. Use a large 3-5 quart skillet with hot oil. With a little patience you get these crispy little beauties!!! Preheat large 3-5 quart skillet over medium heat. Add olive oil. 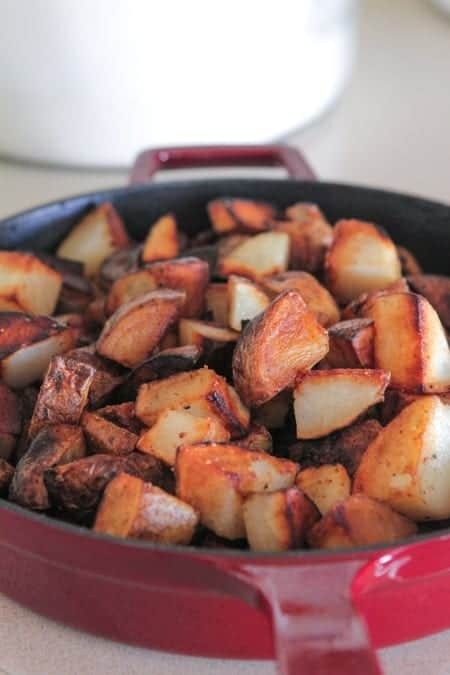 When pan is hot add potatoes. Season with salt and pepper. Stir to combine then let sit for 5 minutes before stirring again. You want to potatoes to get that nice golden crust, so let then sit in the pan for a good 5 minutes after each stir. Continue this process until the potatoes are fork tender and golden crisp. Remove and serve warm. Ohh it’s been WAY too long since I’ve had just good old fashioned crispy potatoes! Thanks for the reminder – they’re going on next week’s menu! Crispy potatoes are my favorite! I usually bake them; either way, delicious! Crispy potatoes are my all time fav. 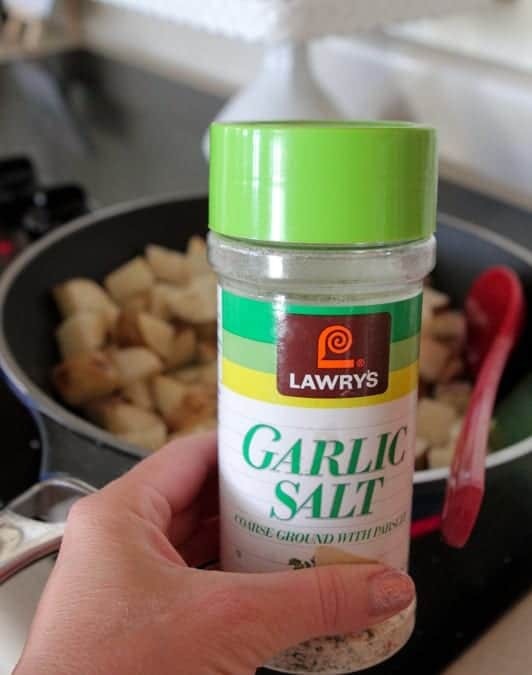 Adding garlic salt is a good idea. Going to try it next time. 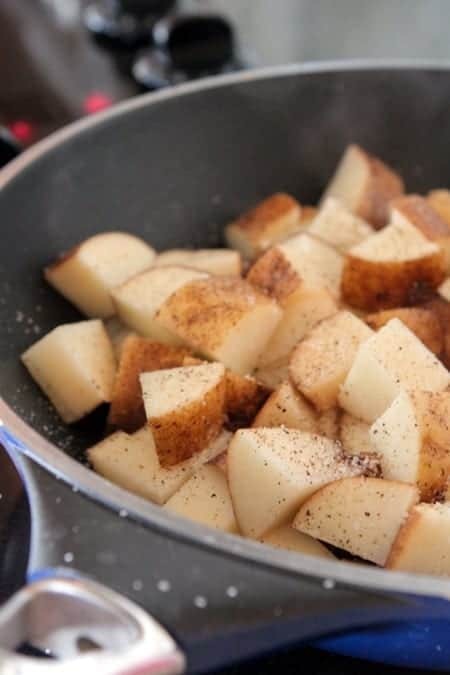 Oh man, I could live on crispy breakfast potatoes. Love your method!! There is nothing better than crispy potatoes! Great recipe, Jenny! My family love crispy potatoes. Your taters look so good! Nice! I love that they are pan roasted as it frees up oven time for other things for a large dinners like a holiday dinner. I could def munch on these all day long! These are beautiful! I could eat crispy potatoes every day of my life. We love potatoes… Caleb will eat the whole pan! these look awesome! probably great with just about everything! 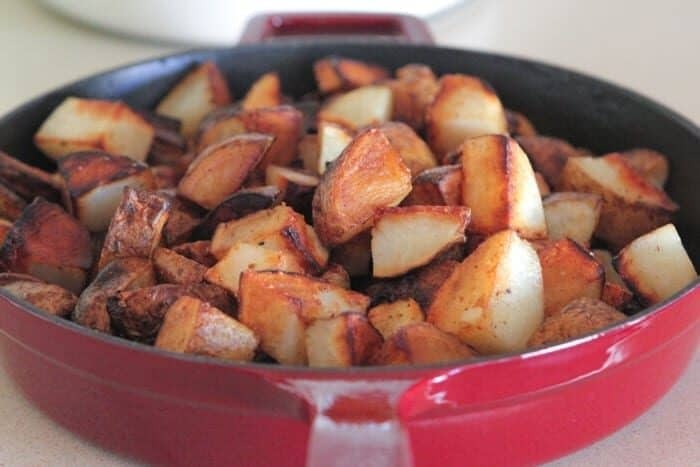 My boys are constantly asking for potatoes – these are perfect! My kids don’t consider it an actual dinner without potatoes. 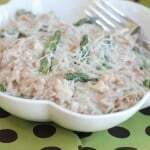 They would love this crispy recipe! Crispy potatoes? 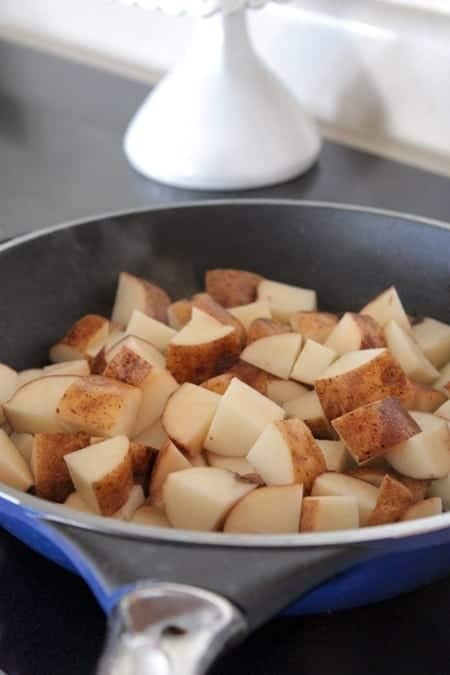 We call those homefries here in Ohio. These are really impressive ideas in about blogging. You have touched some fastidious points here. Any way keep up wrinting. can i freeze these once made for use in a week? 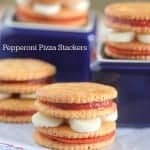 This looks easy to make! I love anything with potatoes in it!! Cannot wait to try it.